The Roland Group is engaged in two major categories of business: electronic musical instruments and computer-related peripherals centered on large-format color printers. Under our slogan “Inspire the Enjoyment of Creativity”, we are steadily expanding our business domain to include the fields of video and images, focusing mainly on video-editing equipment. Our challenge is to turn your imagination into sound, into video, and, finally, into reality. The business of “creating” has become more globalized, diversified and individualized. Consumers all over the world have come to value quality more than quantity. This makes our role so much more critical than ever before. Responding to all these changes in a flexible manner, we are pursuing new growth based on our deep technological power. This has given birth to numerous “world’s first” and “Japan’s first” products. At the same time, we strongly recognize our social responsibility as a company committed to a culture of creativity. We strive to do our BEST to be an organization that inspires “Cooperative Enthusiasm” among all our stakeholders. Roland Asia Pacific is a Sole Distributor for Roland and BOSS products for Malaysia. Roland Asia Pacific was established on 1st December 2004. Constant technological innovation makes the world’s ‘de facto’ standard. From the early electronic instruments to today’s astonishing developments, Roland musical instruments have never stopped pushing the envelope of just what is possible. Even a cursory look makes that evident. Advances that include non-realtime performance capability using pre-programmed data in addition to realtime performance with a keyboard and other instruments are just the start. We are actually at a level that can realize the maximum potential in the most significant factors such as tonality, expressiveness and user friendliness of electronic instruments. Key to achieving such progress has been our unwavering commitment and company-wide enthusiasm for research and development, backed by a production system whose efficiency has been honed to a very sharp cutting edge. A prime example can be found in the desktop music and computer industries where the Roland GS format is the benchmark open standard for versatile applications. Other examples are Roland in-house designing of leading-edge DSP (Digital Signal Processor) chips for use in digital musical instruments, as well as innovative products such as the GS Software Synthesizer. At the Miyakoda testing laboratory, rigorous testing procedures assure Roland product quality and reliability. Bearing witness to our stringent quality control system, Roland Group factories have consistently been ISO 9002 certified. Roland Taiwan Electronic Music Corp. led the way in 1995, followed by the Hosoe factory and the Miyakoda factory in 1996. BOSS Corporation was qualified for ISO 9001 in 1998, followed by Roland DG Corp. and Roland ED Corp. in 1999. In January of 1999, the Hosoe factory added an ISO 14001 certification to its conservation efforts, once again proving Roland’s international commitment to environmental issues. The Producer System — sparking originality for personnel. The originality and innovation that supports every Roland product derives from a flexible grouping of development and production teams united in dedication to our customers. Organized around a group leader or Producer, each development team plans and develops new products. These teams can be considered independent entities with full access to Roland corporate resources. Once planning for a new product is finalized, a production team best suited for that particular product is composed from teams in our production bases worldwide. This is how Roland manages to consistently create hit products rapidly with the most competitive costs. Our research laboratory in Hamamatsu performs basic research into technologies that will figure most prominently in the future. Important projects are handled by a dedicated R&D group formed by talented personnel from various development teams that are disbanded after a new technology has been developed. Each group member returns to his or her original development team which then applies the new technology to create new products. 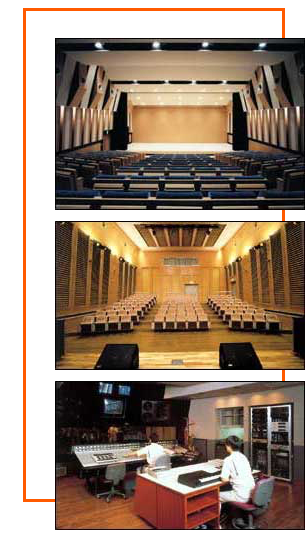 The new developments also make extensive use of Roland’s high-tech sound laboratories and concert halls. The Hosoe factory includes an extensive sound testing concert hall and lab equipped with adjustable wall louvers whose angles can be manipulated to allow hall reverberation to accurately simulate acoustic conditions of various environments. The sound reference hall, part of the Hamamatsu lab facilities which were extensively overhauled in June 2001, employs proprietary RSS technology to accurately recreate various reverberation characteristics. And Lake Hamana Studio, part of the Hamamatsu laboratory complex, makes a major contribution to the development of innovative products that keep Roland in a class of its own. The “301 Project” is a special campaign in progress. Its goals are to develop the No. 1 product in each category with a 30% increase in value compared to previous models. This project has been quite a success, introducing revolutionary products that have been highly acclaimed by professionals. The XP-80 Music Workstation, VG-8 V-Guitar System, VS-1680 V-Studio Digital Studio Workstation, and V-Drums lead the list of such products. In 1997, a new factory in Miyakoda came online to reinforce manufacturing capacity for large-size keyboards including luxurious cabinetry. This factory makes use of a unique ‘cell’ production system in which a single worker completely assembles each product from start to finish. This method of production has of course been associated with the efficient production of high-quality products, and it also can realize small-lot production of various product types, allowing us to accommodate diversified customer needs in a faster, more flexible manner. Localized production satisfies specific market needs. The Roland Group currently has four plants outside Japan and these make extensive use of the latest electronics and processing technology in production. The success achieved in satisfying independent market requirements is directly attributable to Roland’s concept of localized production. This handles everything from materials procurement to final manufacturing, all on a local basis. MIDI: A universally recognized standard for information exchange between electronic musical instruments regardless of model or make. GS Format: Roland specification set for standardizing the performance of sound generating devices. It fully complies with and enhances the General MIDI system.